Don’t miss the Hunter’s Point Avenue Bridge Centennial this weekend, on December 11th, a free event. For more on the HPA Bridge Centennial, click here. 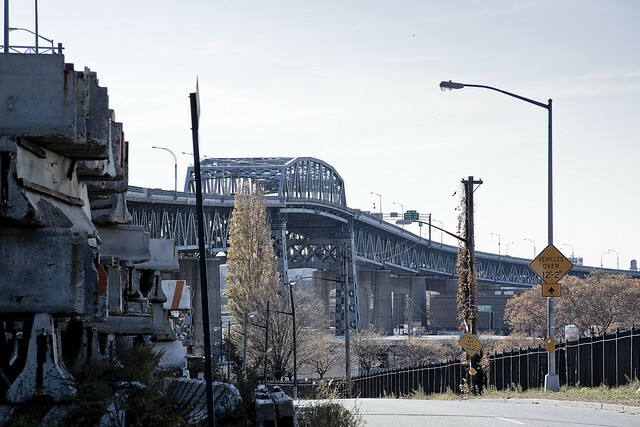 Thrice damned, the Kosciuszko Bridge is scheduled for demolition and replacement, and with it shall go the last of Blissville (or Berlin, or West Maspeth, or Laurel Hill- depends on who you ask to describe this “angle” between neighborhoods). Recent obligation called on me to enter the historic quarter of Ridgewood, and I embarked on the long walk from Astoria with the intention of “checking in” on the area. Unfortunately, seasonal variance in environmental temperature and atmospheric conditions are taking their usual toll on my delicate physical constitution. Numbing begins for me at higher temperatures than most, and even the high 40’s and low 50’s call for woolen hats and gloves, and insulation about the torso is absolutely critical. This ridiculous assortment of threadbare garments forces me to move in a stiff and corpse like fashion, and stepping onto a bathroom scale reveals that my full winter gear (with camera) adds some 30 pounds to my weight. Like one of “Marius’s mules” however, your humble narrator nevertheless endures in his self enforced march across the concrete landscape of the Newtown Pentacle. The awful thing, however, was not the suffering of one sickly and somewhat insane narrator- it was what I could not have seen on 54th avenue. Also, we’ve been to 43rd street before, in the “Maspeth? Laurel Hill? Where am I?” posting of 9/3/2009. …To accomplish this, the new bridge will be built next to the existing structure, and all six lanes of traffic will be shifted onto what will eventually be the eastbound structure. The existing bridge will be demolished, and a new structure for westbound traffic will then be built in its place. The current bridge carries three lanes of traffic in each direction. The final product will include five lanes into Queens and four into Brooklyn, along with a pathway for bicyclists and pedestrians that promises to provide a “terrific view of the Manhattan skyline,” according to Adams. The new bridge will also feature standard-width lanes, shoulders for disabled vehicles and better sight lines for drivers, according to Adams. “This will have significant improvements on the merging problems that exist today,” he said. The state is continuing to negotiate with property owners within the 1.1 mile construction zone to acquire easements and land needed for the project. That is expected to be completed by 2013. 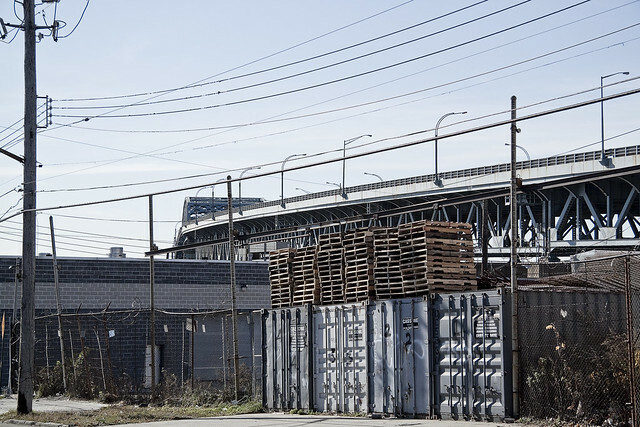 The state is also working with the city Parks Department on a new greenspace that is planned for beneath the approach to the bridge on the Queens side, but Parks was unable to provide details about that. The so called sidewalks which underlie the approaches to the Kosciuszko Bridge (thrice damned) are pedestrian in name only, and the evidence of gathered diesel dust and undisturbed deposits of windblown graveyard soil suggests that no other boots save my own have traversed the space in any recent memory. This is a place for the automobile, the truck, and those who cross it by foot must be sagacious and alert. While passing from Laurel Hill Blvd. to 54th avenue via one of these underpass viaducts, something impossible was suggested rather than observed as scratching about in these deposits. It could not have been what peripheral observation suggests, and it is far more likely that I am suffering from some early phase of macular degeneration or an undiagnosed neurological condition than that which I believed I saw could be material and real. For now, I’m keeping my observation to myself, lest some guardian of the public good who might be reading this recommend me to the psychological hospitals at Wards Island for both my own protection and that of the community at large. Suffice to say, what I think I saw cannot exist in any world governed by wholesome laws of physics and or familiar biology, but it is probably best to avoid the drainage pipes which carry storm runoff from the Kosciuszko Bridge’s BQE down to the streets of this angle between neighborhoods- just in case. 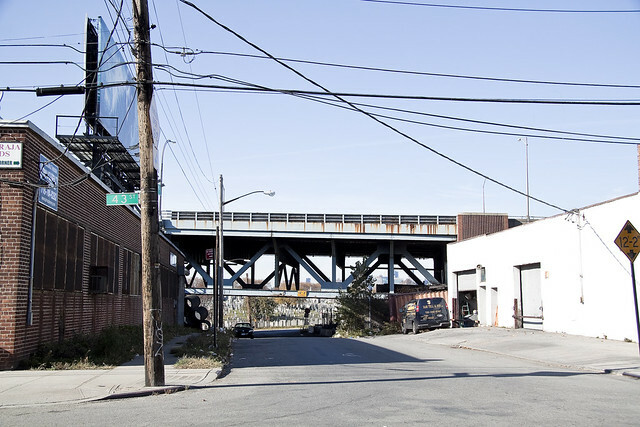 In the early to mid 19th century, virtually the only development along the channels of the Newtown Creek drainage were crossings for roads and turnpikes that linked nearby villages and led to East River ferries. A highway between Bushwick and Newtown was in place by 1670,including a wooden bridge that was most likely the first road crossing of the creek, at approximately the location of present Meeker Avenue. This crossing was replaced circa 1812-14 by the Penny Bridge, a toll bridge on the Newtown and Bushwick Turnpike Road. The first crossing of English Kills along the present Metropolitan Avenue opened circa 1814-16 as part ofthe Williamsburg and Jamaica Turnpike. These remained the only bridges into the 1840s when nearby urban development stimulated more road construction across the marshy drainage. Mid-19th century bridges included the Maspeth Avenue Plank Road to Newtown (1846), and the Greenpoint and Flushing Plank Road linking the Greenpoint ferry to the new Calvary Cemeteryvia present Greenpoint Avenue (1853-54). 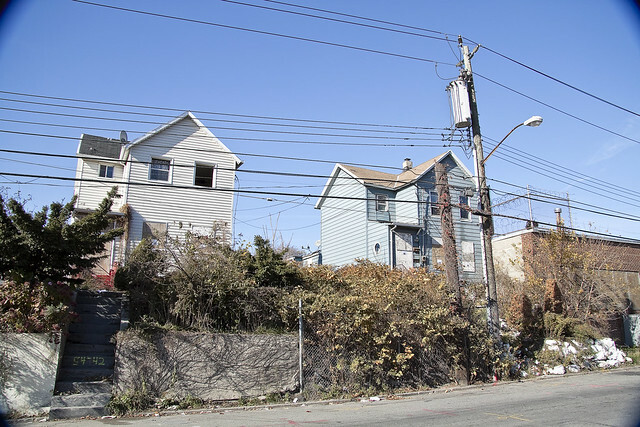 The easements sought for the footprint of the new bridge in Queens will obliterate the last of the residences here. Consultations with knowledgeable sources, including the research staff at Newtown Creek Alliance and Forgotten-NY as well as a coterie of online sources for ancient maps and lost railroad sidings, suggest that the area modernity refers to as “Blissville” or “Laurel Hill” or “West Maspeth” was referred to in earlier times as “Berlin” or “Berlin Hill” or “Berlinville”. The inestimable Kevin Walsh of Forgotten-NY, ever generous with his encyclopedic grasp of the history of the Megalopolis, actually supplied links to jpegs of century old maps which describe this place for consideration by the curious and inform the modern viewer as to the atavist nomenclature of the very streets themselves. Luckily, 2 of these maps may be found online and are publicly available for inspection, here and here. In October 1936, the Commissioner of Plants and Structures for the City of New York proposed a high level fixed span that would provide 125 feet above MHW between bulkheads. This bridge today is known as the Kosciuszko Bridge and replaced the Meeker Avenue Bridge. The marine community for sometime in the 1930’s had sought to have the Meeker Avenue Bridge replaced and supported the proposed 125’ vertical clearance for the new bridge. At that time, the companies and organizations included: Queensboro Corporation, New England Navigation, Brooklyn Union Gas Company, Mystic Steamship Company, Tide Water Oil Company, Brooklyn Chamber of Commerce, New York Towboat Exchange, Inc., the Port Authority of New York/New Jersey, and Card Towing Line. However, two Corporations, Merritt-Chapman & Scott Corporation and Cross, Austin & Ireland Lumber Company with docks above the bridge objected to any clearance less than 135 feet above MHW and requested that a vertical clearance of 150 feet be required. 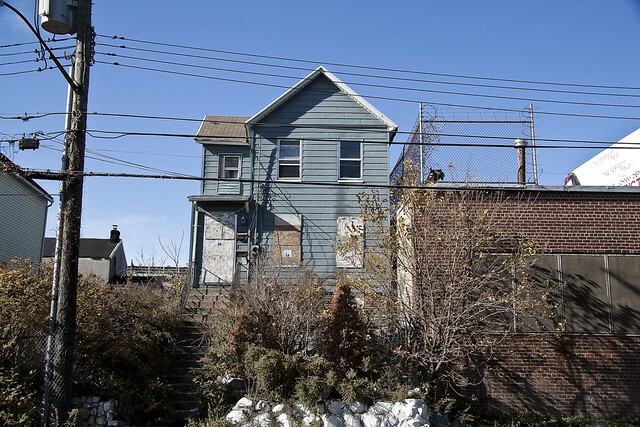 If my reading of these maps is correct (they often aren’t, so decide for yourself), then these doomed houses are the last residential survivors of Washington Avenue (43rd street) between Waters Ave. (54th rd.) and Columbia Ave. (55th ave.). Sources also inform that that the remarkable declination of this area is not part of “Laurel Hill” – the geological feature which Calvary Cemetery is carven into – but is instead “Berlin Hill”. Other… documentation… provided to me remains confidential, but confirms the olden names of these lanes. 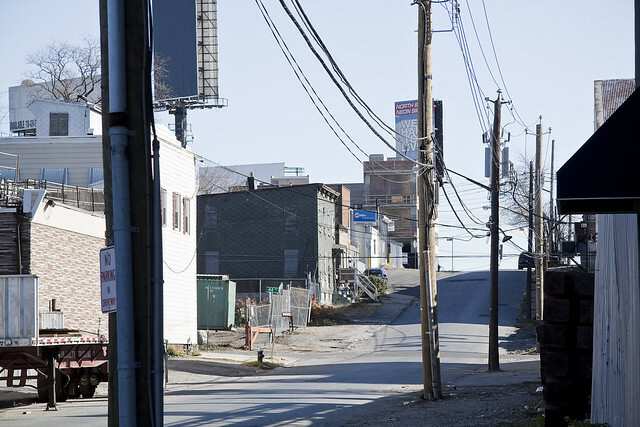 Our friends at forgotten-ny have, of course, been in this spot before- check out the FNY page on Blissville/Laurel Hill for an overview of the entire area and a scholarly erudition which sets the gold standard for the entire genre of urban exploration. On page 17 of this slideshow presentation from the NYS DOT, one might observe the footprint expected for the Queens side of the Kosciuszcko Bridge project. The technical term for the properties affected, incidentally, is easement– which the State will be acquiring using its voluminous power of eminent domain. All that remains here now is industry, and a somewhat relict rail line. When the construction on the new Kosciuszko Bridge (thrice damned) begins, the long and cold winter nights in Berlinville will belong only to those who lie within venerable Calvary, and to that which could not have been reaching out from a drainage pipe beneath the Kosciuszko Bridge (thrice damned) and grasping at a startled pigeon, and whatever festering things there may be which lurk in that nearby stagnation of innocence called the Newtown Creek. Such things, and places, do not exist- after all. The rate of skeletonization and the present condition of the corpse can be used to determine the time of death. After skeletonization has occurred, if scavenging animals do not destroy the bones, the skeleton of mid to large size mammals such as humans takes about twenty years to be completely dissolved by acids in the soil leaving no trace of the organism. In neutral pH soil or sand, the skeleton will persist for at least several thousand years before it finally disintegrates. Infrequently, however, the skeleton can undergo fossilization, leaving an impression of the bone that can persist for millions of years.